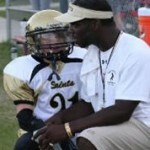 The Pop Warner St. Augustine Saints have been helping the community’s youth by teaching leadership skills, teamwork, discipline and self confidence while emphasizing the importance of education. We take pride in bringing together boys and girls from the city of St. Augustine to learn important life skills through organized tackle football and participating in cheer/dance. Our goal is to teach the fundamentals of youth football and cheer while stressing the importance of academic achievement. We work to instill the values of teamwork, pride, discipline, leadership and good sportsmanship in all of our participants. Serving Youth Football players and Cheerleaders in St Augustine Florida including World Golf Village, Palencia, Kensington, Las Calinas.